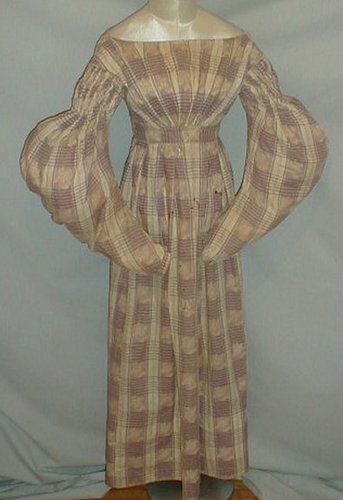 A circa 1825-1827 mauve and ivory cotton print dress. The fabric has a stripe plaid pattern. There is an ivory rose within the mauve stripe. The bodice has full gigot style sleeves that have ruching at the top. The front of the bodice has fan pleating and the neckline and armscyes are piped. The dress has an empire waistline. The bodice is lined with linen and has a brass hook and eye closure at the back. The skirt is unlined except for a wide band of linen at the edge of the hemline. The dress is all hand stitched. As can be seen in the photos there are age marks and scattered holes in the front of the skirt and on the lower edge of both sleeves. The age spots ranch from tiny pea size to one that is 1½ inches. The holes ranch from tiny pea size to two dime size holes on one sleeve and a 1 inch split on the skirt front. There is no underarm discoloration but there are period mends under both arms. A rare and highly collectible dress. Bust 30 Waist 24 Skirt length 37. I apologize for the lack of pictures - it's my fault. I waited too long to post this one. However, I thought even with this one picture, this dress needs to be added.